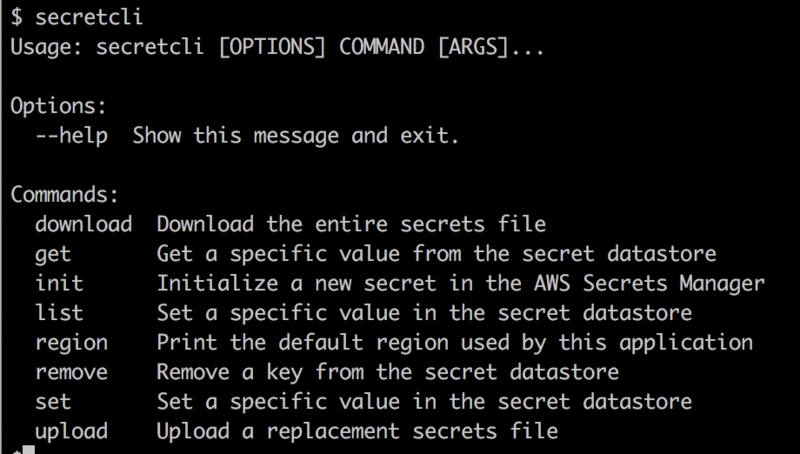 I love the AWS Secrets Manager, but have found the awscli tools for it to be a bit bulky. Most of the time all I want to do is download a file, edit it, and upload it again- and even then I normally just want to quickly change a single value inside of my “secret”. Add, edit, or remove a single value from a Secret. Like all of my projects you can find this one on Github, and contributions are always welcome. I regularly run into the need to use part of a URL inside of shell scripts- such as extracting the hostname and port from a URL in order to check if the service is reachable- and got a bit tired of screwing with regex. 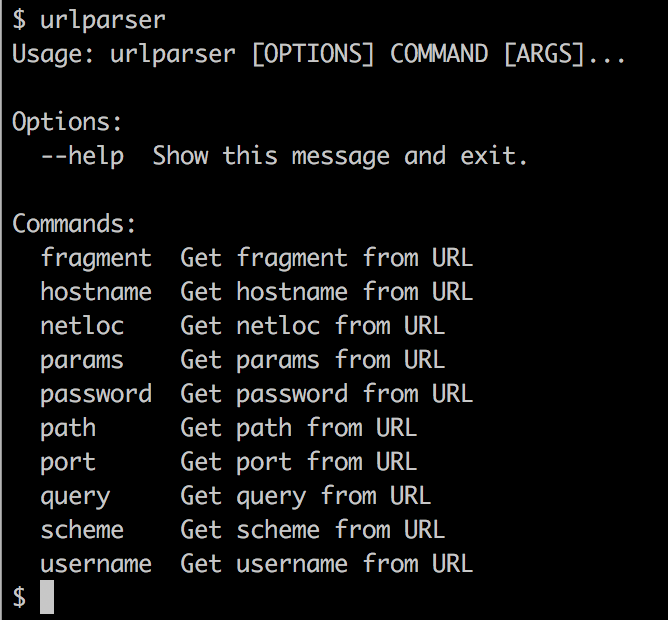 The urllib python library’s parse component is a great tool for managing this, so I wrote urlparser to expose that library directly from the command line and tossed it up on pypi for others to use. When working with the AWS EC2 service in a programmatic way I’ve repeatedly run into a simple problem- how can I get up to date metadata about the various instance types in a programmatic way? It turns out this simple problem does not actually have a simple solution. AWS offers their Bulk API, which has all the information about every EC2 instance offering in a single giant JSON file, but parsing it with python3.6 will give an OOM error on machines with only 2gb of ram and actually getting the desired data out of it is not a trivial task. The AWS Query API requires AWS credentials and specific IAM roles (and has almost no documentation), making it overly burdensome to use. Information about each instance type should be easy to access. The data should include hardware specs, prices, and regional availability. The data should be accessible to pretty much any programming language. The data should be reasonably up to date. The API should have high availability and decent security (SSL). Hosting this should not cost me a fortune, even if it gets popular. In the end I built a “static” API hosted on GitHub Pages. Every six hours CircleCI kicks off a job to download and process the Bulk API data, generating two files (JSON and YAML) with a cleaned up version of the instance data indexed by instance type. If the files are different from what is already stored in git then CircleCI commits the new files and pushes them back up to GitHub, so the API is never more than six hours out of date from the information available from AWS. Using Github Pages has some real benefits as well, with built-in SSL and the Fastly CDN. The whole system requires no direct hosting on my behalf, and will stay up to date without any need for me to interfere as long as AWS does not change the format of their giant json file. Since the whole thing is stored in git it also creates historical data as a matter of course, showing exactly when changes have occured. The whole project is, of course, available on Github. The API itself, with documentation, is on Github Pages. This weekend I dug into the Github API to build gitconsensus, which lets communities create truly democratic projects using Reactions as a voting mechanism. 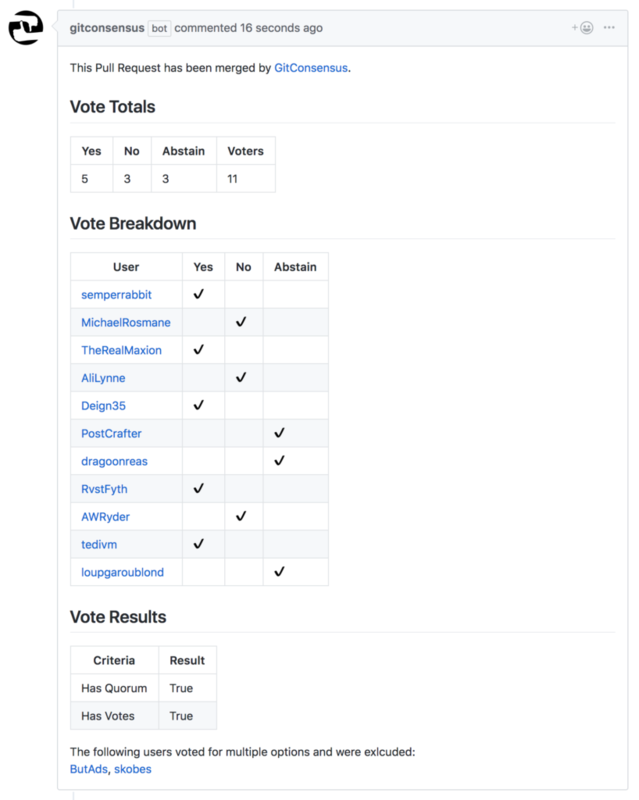 Projects can define consensus rules (minimum age of pull request, quorum for votes, threshold needed for passing) using a yaml file in their project root. 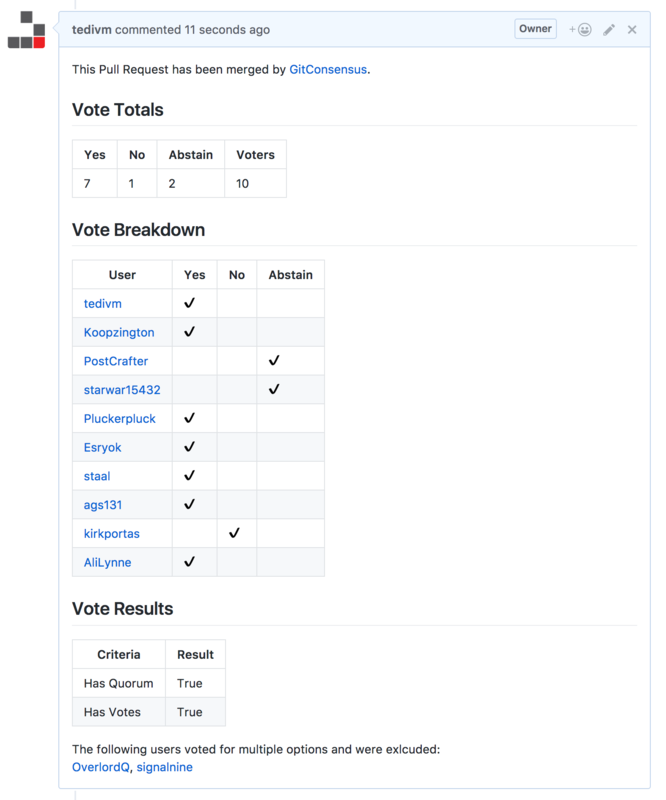 Pull Requests that meet the consensus rules will get merged, and those that do not meet them after a certain amount of time will get closed. The project is available now on pypi and can be installed using pip. Over the last year I’ve run into some pretty massive JSON files. One recent examples is from AWS, which publishes a 120mb file containing a list of their available services that they have yet to provide documentation for. Attempting to open that in a standard editor is not going to be pleasant, and while tearing it apart with something like jq is certainly an option it doesn’t feel like the best approach. 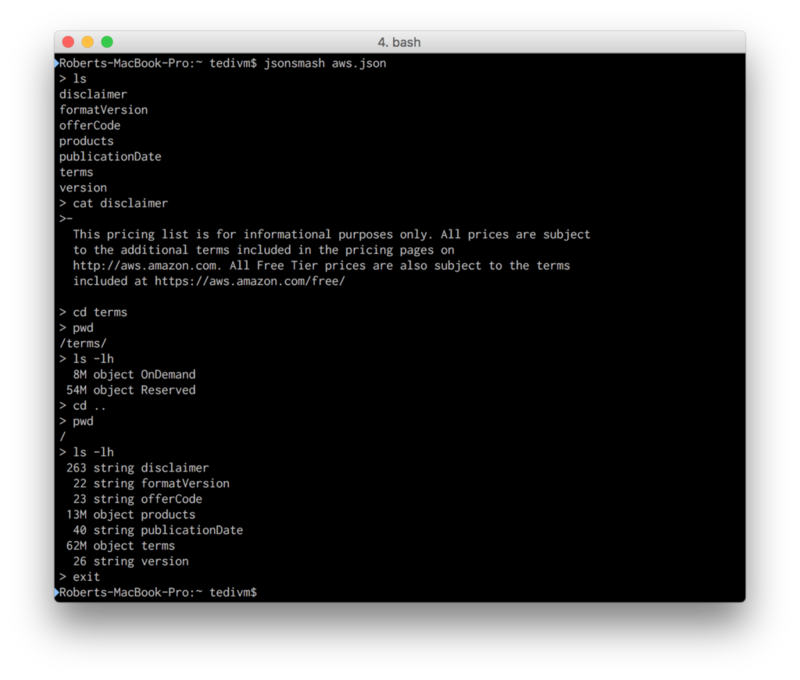 That’s why I’ve build jsonsmash, an emulated shell that lets users browse through their massive json files as if they were actually filesystems. It uses shell commands any linux user would already be familiar with to make it very straightforward to figure out the schema of a json object (even if it is a few hundred megabytes) and pull out specific data. Development is on github and the package is published on npmjs.